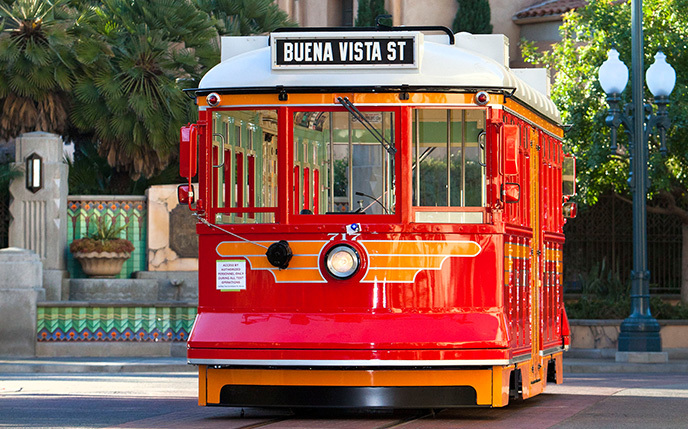 The Red Car Trolley is one of those attractions that serves to offer up a bit of nostalgia to go along with a relaxing ride through Disneyland and Disney’s California Adventure parks. Hearken back to the 1920s modes of transportation, and imagine you are a young up and coming Walt Disney, taking the trolley into work at the Studios. With it’s nostalgic look back at a bygone day, the Red Car Trolley is one of those attractions that, while not necessarily an e-ticket attraction, is still one that you don’t find very often, and one that will not only amuse you, but also deliver you from point a to point b! I don’t know if it gets much traffic, but I for one am looking forward to taking a ride! If you’ve missed any of our countdown series, you can still take a look at them! We have a special page we are working on that has all the links to each of the posts we’ve done so far. Just click on our 100 Days til Disneyland link to pull up the page!